SUMMARY: When the weird new girl boards the school bus, no one wants to scoot over so she can sit down. No one except Park, who only does so reluctantly. At first, Park wants nothing to do with sharing his bus seat with Eleanor, but she starts to grow on him. REVIEW: Loved it! It's touching, heartbreaking, and just so darn sweet. 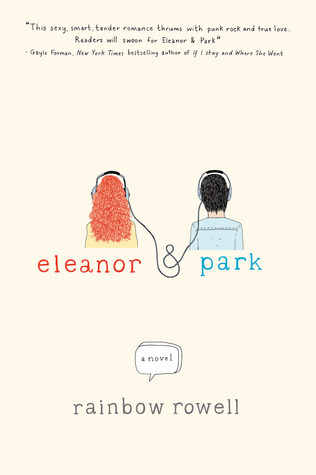 Park and Eleanor are both believable characters, and I bought their romance hook, line, and sinker. Best of all, it's not insta-love--Park falls a little quickly, but I wholly believe he truly loves her when he says it. The romance takes its time, and I love how honest both characters are with themselves. The relationship isn't perfect--they argue, play mind games, disagree, are insecure, and even lie to each other--but that's life. Love is new to both of them, and they are learning to be a couple in a realistic way. And the 1980s references! So many songs, games, TV shows, movies, all naturally incorporated into the story. The setting really works for this one because it makes it so much simpler, sweeter. No cell phones. No social media. Families that eat together. Kids playing in the park. It's not a perfect time, but it sure feels simpler. Ah, nostalgia! I also love the first page, which sets up the outcome of the relationship. I loved knowing that it would ultimately end and wondering why Park misses Eleanor. Is he an old man, missing his recently-deceased wife? Is it simply a fight that occurs in the middle of the book? Did she die? Move? What happened???? Starting the story at the end really kept me turning the pages. The first page tells the reader that this story might not end happily, and I just couldn't stop turning the pages until I found out. THE BOTTOM LINE: Beautiful, sweet, absorbing. I loved every second. STATUS IN MY LIBRARY: I would LOVE to get this book for the library, but there are some mature themes and language in this one. High school librarians, however, should buy multiples. I so agree about this book!!! And luckily I am a high school librarian and we will definitely be getting multiple copies of this book. And some of my friends say another good read like this is Aristotle and Dante Discover the Secrets of the Universe. Yes, I was sad about the mature themes as well. My daughter is Eleanor, so I was hoping for birthday present material! I wasn't expecting to like this book as much as I did. It really does take you back to being 16 and in love for the first time. A very easy read if you're looking for something light.